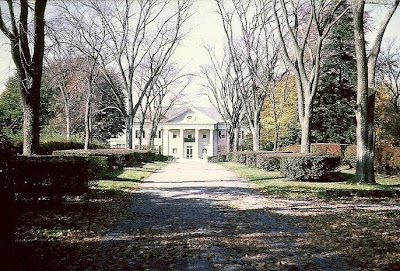 'Villasera', the Reverend Joseph Hutcheson estate designed by Charles A. Platt c. 1904 in Warren, Rhode Island as seen in November 1965. Click HERE for more on 'Villasera'. Photograph courtesy of Old Grey Dog. How very great to see this. Such a fine house and landscape. A serious loss to New England architectural history. In other news, in one of the many blogs in the Zach empire, Kellsboro Jack noted that another important building, the Calhoun house by Philip Trammel Schutze in Buckhead GA is for sale, with no takers--the bold plasterwork of the interiors, and the Allyn Cox murals, all so superb. Very sad. I think of it because if it and Villasera were to have a love child, it would be Swan house, also by Schutze, very much a an amalgram of the two. Any link to the Calhoun House? great vintage postcard of the garden, from that era that people allowed their houses and grounds to be used on cards.